Table tennis is a popular game around the world due to its emotional nature when you’re playing it. Behind every player’s mind is the desire to win. Having already practiced the best tactics to use when playing, what is left in your mind is the racket you’re going to use to enable you to win this amazing tactical game. It’s the reason why you need to read this Idoraz Table Tennis Paddle Review. The Idoraz table tennis racket is an incredible device, which will ensure you enjoy your game. Let’s look at in detail. 1 Why Do I Recommend Idoraz Table Tennis Paddle? 1.1 This Racket Is Best For Whom? 1.2 Why Idoraz Table Tennis Paddle Is Not For Everyone? Why Do I Recommend Idoraz Table Tennis Paddle? The Idoraz Paddle provides you with the right balance of control and speed, making it ideal for a recreational player looking forward to improving his or her table tennis game. While carrying out this Idoraz Table Tennis Paddle Review, we enjoyed the excellent balance provided by this device. It offers users a spin rating of 93, ensuring incredible balance and spin as they indulge themselves in the table tennis game. According to the International Table Tennis Federation (ITTF), the blade of a table tennis racket should at least be made of 85% natural wood. 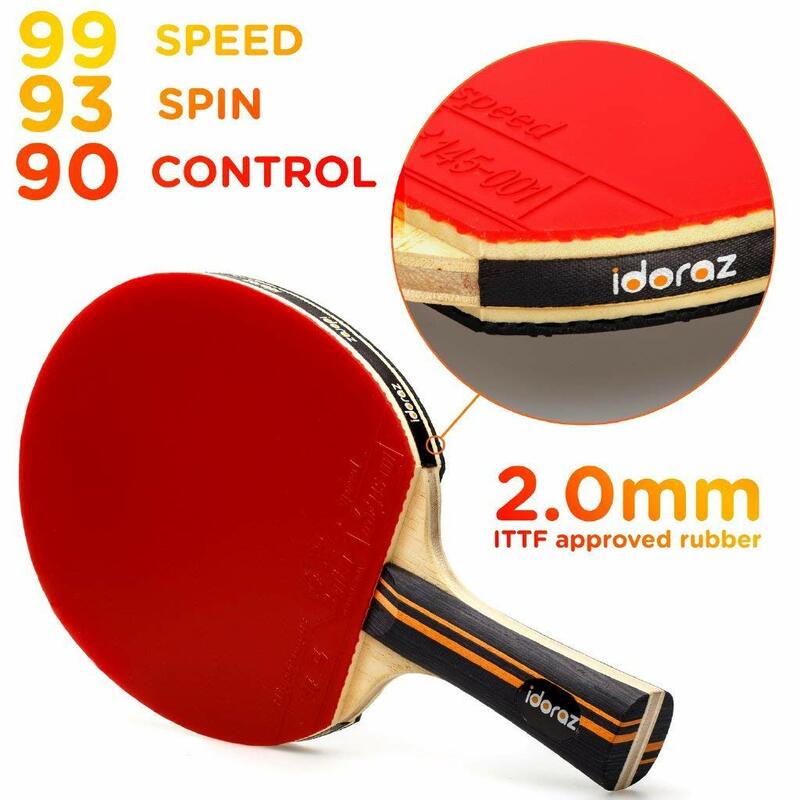 The Idoraz Table Tennis racket features a pure wood construction, which means that you will enjoy the best ball feel, speed, balance, spin and consistency. The Idoraz Table Tennis racket enables you to step up your game thanks to its robust construction. This racket is covered by thick rubber (ITTF approved), meaning its ideal for tournament play. The rubber acts as the paddle’s head and helps to make contact with the ball with strikes from the player. This paddle racket features a pure wood construction that enables you to enjoy improved control and coating technology, which makes sure you get accurate and faster shots. This bat is specifically designed to give you extra control over the backspin. The Idoraz Table Tennis racket is arguably the best model for recreational players. This paddle weighs 0.4lb meaning handling and using it is one easy experience. If you prefer a faster game and love playing close to the table’s top, you will enjoy using the Idoraz Table Tennis bat. When playing with it, you’ll quickly adapt to its weight, enabling you to improve your game. It responds, fast and offers a perfect spin, which your playmates will admire. You’ll want to practice more and enjoy your game using this amazing table tennis bat. The 90 control rating and 2.00mm sponge coating mean that you will enjoy excellent control while making fast shots. Remember that for you to enjoy your table tennis game; you’ll need to make fast and accurate shots, which this device enables you to perfect. Users will enjoy superior control, which is one thing you need to have to step up your game. Beginners will especially find this racket to be ideal for their needs. It’s extremely helpful if you’re looking forward to improving your game. When ordering the package will come with a premium carry poach and Idoraz ping pong Racket. The carry poach enables you to easily carry the racket around when not using it. You’ll able to improve your game and play it as a professional. Remember that when buying a paddle, you need to consider its comfort, quality, functionality and technology. It will enable you to purchase a brand that suits your needs rather that one which reviews recommends. The Idoraz paddle stands out since if offers you want to improve your game. Make sure you purchase this paddle. This Racket Is Best For Whom? The Idoraz Table Tennis racket is the perfect device for players who want to improve to improve their skills and perform in tournaments. This paddle feels great on the hands and is lightweight, meaning it’s not heavy when you compare it to its competitors. It provides users with excellent speed and power, which is one thing you hope for when looking for the best paddle. In addition, it comes with a carry case, enabling you easily carry it around. You will love using this bat during your weekend or routine practices. Why Idoraz Table Tennis Paddle Is Not For Everyone? It may not be ideal for small children since it may be a bit heavy for those less than 12 years old. Fortunately, it weighs just enough to have power without the user having to make too much movement. Just as with all good things, you’ll need some time to get used to it, meaning, in the end, you’ll improve your game. Question: What is a Ping Pong Paddle? Answer: A ping pong paddle is also known as a table tennis bat or racket. It’s a device used for playing table tennis games. Question: Which is the type of Rubber used on the Idoraz Racket? Answer: The Idoraz paddle uses ITTF approved rubber that ensures you enjoy a more offensive play. Question: Can one replace the rubber on this Racket? Answer: Yes, Just as with any other professional table tennis racket, you can change the rubber. It means you will enjoy longer service and memorable experiences. Question: What type of Ping Pong Blade should one choose? Answer: If you’re a defensive player looking for better control, you should look for blades that are covered by tacky or textured rubber. The extra texture will grip the ball a bit longer when compared with a smooth surface, which enables you to place the next shot perfectly. If you’re an offensive player, you should opt for a hard paddle to provide you with plenty of power. When it comes to choosing a table tennis racket, you should make sure you research about its comfort, quality, function and technology. It will enable you to make the best decision when making the actual purchase. Fortunately, this Idoraz Table Tennis Paddle Review gives you all the features and benefits of the Idoraz model. It is exceptionally fast, gives you superior control while the racket is coated with thick rubber (ITTF) approved. It’s a paddle that you will admire holding in your hand as well as using it to improve your game.